Professional units conversion for engineers. Uconeer has 450 units in 48 categories. Covers all the basic categories but adds engineering specific categories like enthalpy, entropy, heat capacity, heat transfer coefficient, moment of inertia, stress, surface tension, thermal conductivity, torque and viscosity. Add, edit, delete, export, import and merge custom units. Define favorite conversions. 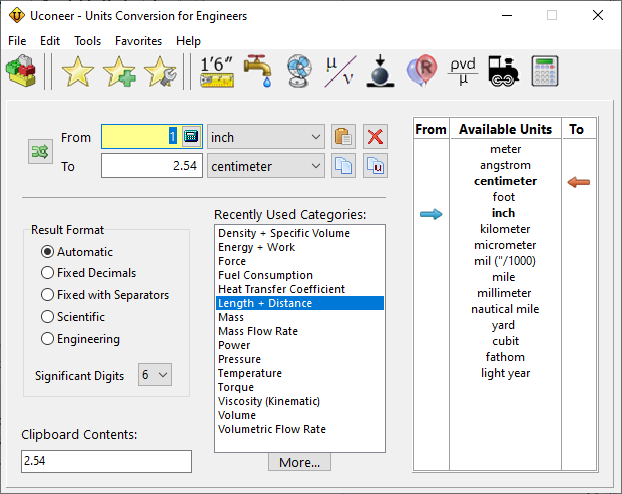 Converts feet, inches and fractions to and from decimal lengths. 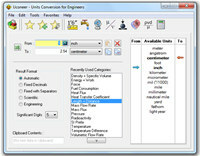 Converts between dynamic and kinematic viscosity. Converts between volumetric and mass flowrate for gases and liquids. Steel hardness equivalents. Universal gas constant in 900 sets of units. Calculator for reynolds number, velocity and flowrate in pipes. Interface is kept simple by exclusion of all archaic and esoteric units. Powerful formatting and clipboard features. Uconeer is a business program that works under windows xp, windows vista and windows 7. It supports both 32-bit & 64-bit windows editions, therefore it could run faster on 64-bit computers. Estimated download time for Uconeer on a common adsl connection is less than a minute. Version 3.3 was released two thousand one hundred ninety two days ago by Katmar Software. Click the green download button to download it now.